We absolutely adore the Four Seasons hotel brand, mostly because we always know what to expect - impeccable attention to detail and great service! 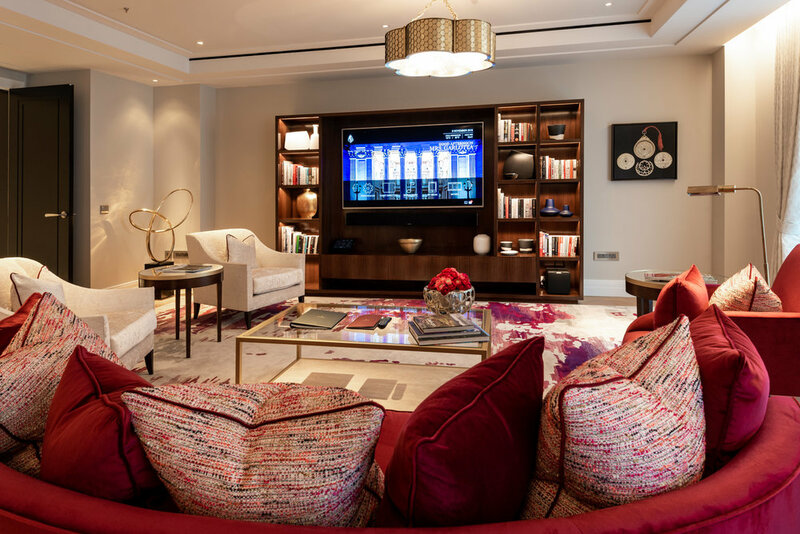 So we knew their new apartments at The Four Seasons Ten Trinity Square would be nothing short of outstanding. Having stayed at other Four Seasons locations throughout our travels, our expectation meter was set to ‘spectacular,’ but when a high-end hotel aims to please, they usually hit a home run. And Ten Trinity knocked it out of the park. The hotel is housed in a Beaux Arts building form the 1920’s and has been thoughtfully restored with many of the original details intact. The flat roof and large white pillars at the facade pay homage to the Beaux Art look, and the elegant interiors bring it into the present. Ten Trinity kept us endlessly impressed from check-in through our final day. From the artwork to the ambiance, chic sophistication was at the forefront. It was just beautiful! We were invited to stay in a two bedroom apartment (PS: You always accept an invitation like this), which was incredibly spacious and well-designed. It was hard to remember we were in the middle of London where space is usually limited. When we first entered the apartment, we were taken aback by the long marble entryway which led to the various rooms in the apartment. High ceilings, shiny wood slat floors, plush carpets, and wall-to-wall style made this apartment worthy of an architecture award. And as special and elegant as the setting was, it still gave way for rest and relaxation. Sophisticated but not stuffy, the 2-bedroom was the perfect balance of class and comfort. Even Axel was all about this set-up; crawling around had never been so filled with curiosity! And with the extra bedroom, he was pampered like a little prince with his very own room, decked out with a cute crib and all the baby essentials we could ask for. From a changing pad to a humidifier, even diapers, body wash, and a bottle warmer – the staff thought ahead and went above and beyond with their attention to detail…even for their littlest guest. Another perk? The in-room washer and dryer. With a baby on board, spills and stains are part of the program. While we didn’t wind up doing any cooking during our time at Ten Trinity, we could have prepared and enjoyed all of our meals there if we were so inclined. The fully-stocked kitchen was impressive, with a mid-kitchen island to gather ‘round and plenty of prep space, even a gourmet would give this kitchen two thumbs up. If we have the chance to get back again, perhaps we’ll make better use of the kitchen and whip up something tasty for a night in. That said, we did indulge in room service. Paired with a nice bottle of wine, we sat back, took in a movie (on a giant TV, might I add), and did what one should do in a space like this - relax! Ten Trinity doesn’t skimp on service. Amenities abound and each offering is done with the care and quality one would only expect from a Four Seasons property. The Gielly Green Salon for hair and beauty is perfect for pampering, be it a quick shave or an extensive coloring treatment. For a swim or just a relaxing dip, there is a fabulous pool – refreshing after a long day of sightseeing. For the fitness fanatics, keeping up with a workout was no problem. Top-of-the-line equipment and an inviting space made working out feel pretty fine. 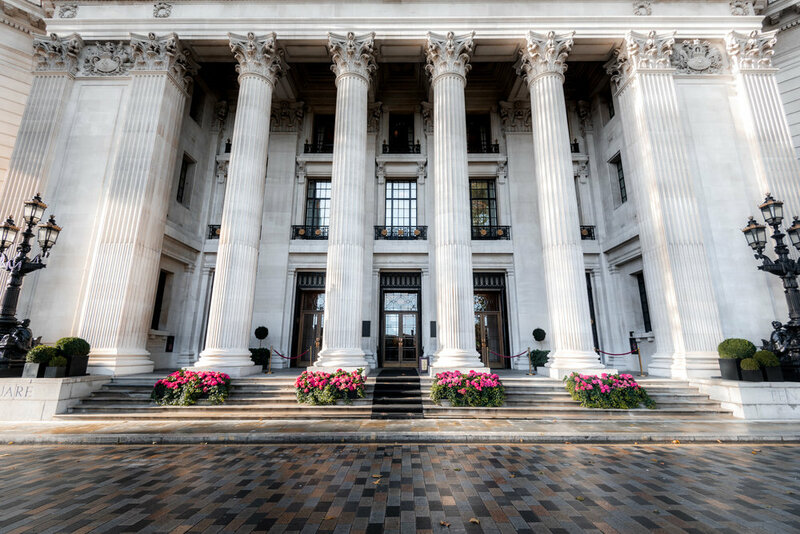 Ten Trinity features four dining options: La Dame De Pic London, a Michelin Guide one-star recipient; Mei Ume, offering flavors of Asia like sushi and dim sum; Rotunda Lounge, casual without compromise; and Rotunda Bar for nibbles, sips, and setting the mood. 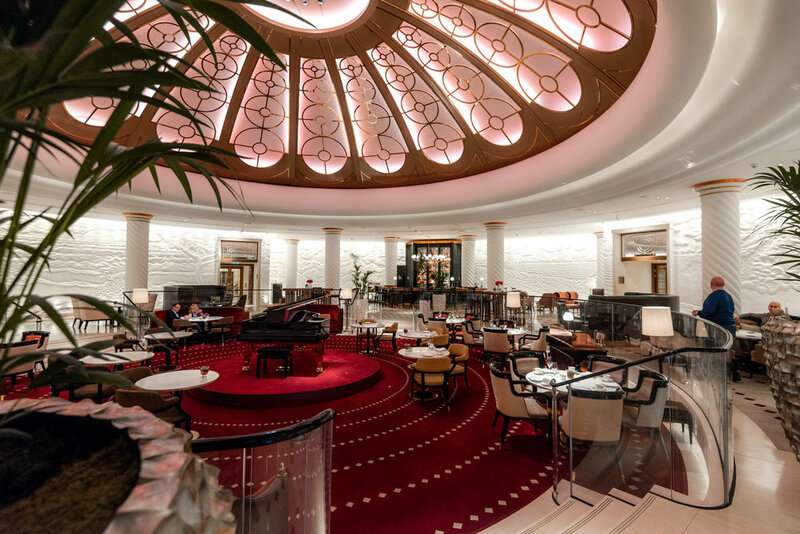 We started each day at the Rotunda Lounge, a beautiful space with breathtaking domed ceilings and a cheerful overall vibe. They always had a small breakfast buffet available or you could order of the ala carte menu. They offer an afternoon tea as well, with finger sandwiches, cookies, scones, and the like. For one evening, we were craving a date night, so we organized a babysitter to come, through Hopes and Dreams. They service sends nannies to different hotels throughout the city and do their best to always send the same nanny, so Axel was already familiar with the nanny and we took advantage! We started with cocktails at Rotunda bar and then dinner at La Dame de Pic, and yes we stayed in the hotel the entire night. It was fabulous! At night the bar area gets pretty busy and is a hotspot for the locals and guests alike. They serve some of the best craft cocktails we’ve had and the ambiance is fun, yet relaxed! If you get a chance, sit at the bar and just tell the bartender what you like and they’ll work their magic! Inventive, delicious and strong, these cocktails were pretty memorable and we’ll definitely be back! After a few drinks we headed over to dinner at La Dame de Pic which was heavenly. Their award-winning food and service was the peak of our trip. It was french cuisine at its finest, every morsel was better than the last. From fresh cheese gnocchi to duck smoked with vanilla, the dishes were unique and crafted ever so artistically. We couldn’t get enough of the Berlingots – petite parcels of two cheeses, wild mushrooms, woodruff, barley, and roasted hazelnut consommé. 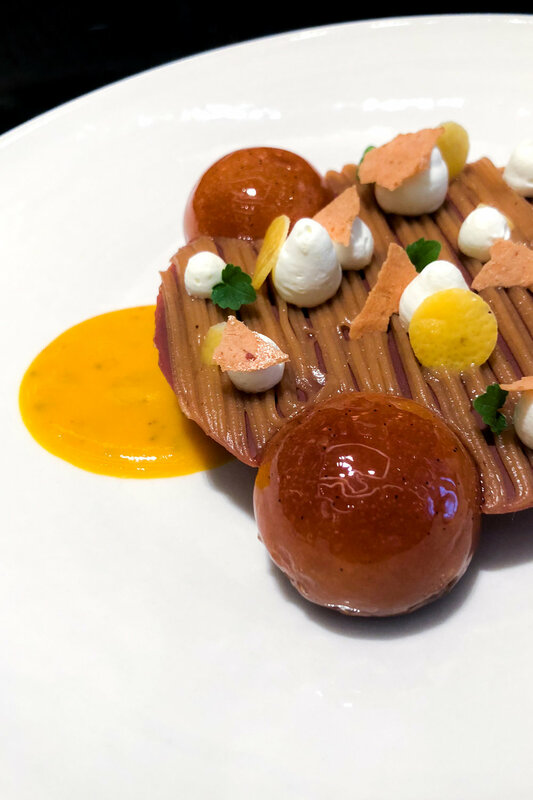 Paired with the restaurant’s alluring ambiance, La Dame was a culinary moment we won’t soon forget. Even if you’re not a guest at the hotel, this restaurant is definitely worth checking out and adding to your restaurant bucket list! Thanks to the centrally-located positioning of the hotel, we were easily able to get around and take in all the sights. From walking over the Tower Bridge, to walks along the river, we made the most of our time in the area. Historical sites and plenty of dining and shopping options gave us more than enough to do when we weren’t marveling at the many “wows” inside the hotel itself.